We all want to show up higher in the SERP (Search Engine Results Page). That’s the name of the game. Most clients will see a rise in ranking and love you for it. However, have you really completed your job as a web marketer by improving your client’s key terms positions? More often than most people think, a rise in ranking does not improve the bottom line. In fact, some clients will report that despite a rise in ranking, an improvement in calls/sales have yet to come. The truth is that improving ranking does not necessarily improve sales. Of course we want to improve our ranking, and in order to do this, we take a look at keywords, and their ranking data. However, while there is no question about the value of checking a set of keywords against the SERP and finding out their positioning, this information is simply over rated… and I’ll explain why. Knowing the rankings for a set of keywords doesn’t really give you an idea of performance, it’s just a number. Not once, but many times I have witnessed keywords with high commerciality and decent search volume entering the performance zone (position 1-5), with little to no improvement. For the experienced readers, this is probably starting to sound familiar. Improvement can be defined as: ranking increase, additional traffic, more conversions, better CTR, impressions, etc. However, some improvements are only stepping stones to end goals. We should treat some improvements as signals indicating that we are on the right track, and others as actual success metrics – working towards reaching our goals. With this in mind, I am going to discuss discovering a website’s high ranking keywords and their signals, and more importantly, understanding how to utilize them for perusing success metrics (conversions goals). Let’s pause for a second…. I know some of you might think that conversions on a website are affected from a range of metrics that sometimes SEO experts have no control of (no budget to improve code/design, bad sales copy, wrong call to action, bad offer all together, etc). So how can goal completions be an indication? To start, you are right! However, even though you still might not be able to reach the full potential of a website due to barriers, you should be able to see some incline with your success metrics, and that’s enough to prove that what you are doing is working. Getting more or less results is probably out of your hands if you don’t have access/resources to improve on-page conversion metrics as part of what you do. You should know that you might not find all of this data unless you have a PPC campaign in place, which if that isn’t the case, you will need to mine this information somewhere else. My method has helped me rely less on scraped keyword ranking data and more on what’s important to improve my client’s bottom line using Google Webmaster Tools (WMT). Instead of checking the positioning of a set of keywords I/the client came up with, I compare them to the search terms list in Google Webmaster Tools to see what I’m already ranking for. You get the idea, right? I compare the core key terms I want to rank for as Phrase Match with what Google indicates I’m already ranking for. Aha moment! You now have a list of terms that your website is showing up for in the SERP that you most likely didn’t know about. You can do the same thing for each core keyword on your list, until you have a long list of keyword versions (and some exact match) of your core ones. How To Do This Screening in Webmaster Tools? Download the list of queries from Google Webmaster Tools. Note: this table provides 1000 records. Unless you are an eCommerce store with many products, that should be more than enough. However, and for probably a limited time (until Google takes this option out), Google gives the option to see up to 10,000 search queries if you just click the link ‘Go back to the old search queries report’. What Do You Do With These Keywords? Any combination of Low + Low means that the work needed is beyond a few tweaks. When you are done with all content updates, wait for the next few crawls, review and adjust. You now probably see why just checking ranking for a list of keywords might feel like a half-way job. There was no direction on which actions to take and why. Right now you have your signal metrics to give you a clear direction. The results will display a table of URLs. Simply try to improve anything ranking on pages 2 to 5 (will show in the table positions 10.1 to 50 in the SERP. These pages have more chances of improving with a few minor tweaks, as opposed to pages 5 and down which indicate that relevancy level need more than a few content changes to bring them up in ranking. Why Do I Need to Wait For a Few Crawls? If you are working on inner pages, you want to make sure you give Google enough time to update its index. Alternatively, you can use the option in WMT ‘Fetch as Google’ in order to expedite this process. Simply continue working on the same excel file, but do your searches and sort by company name/ business owner name and color the cells in a different color. 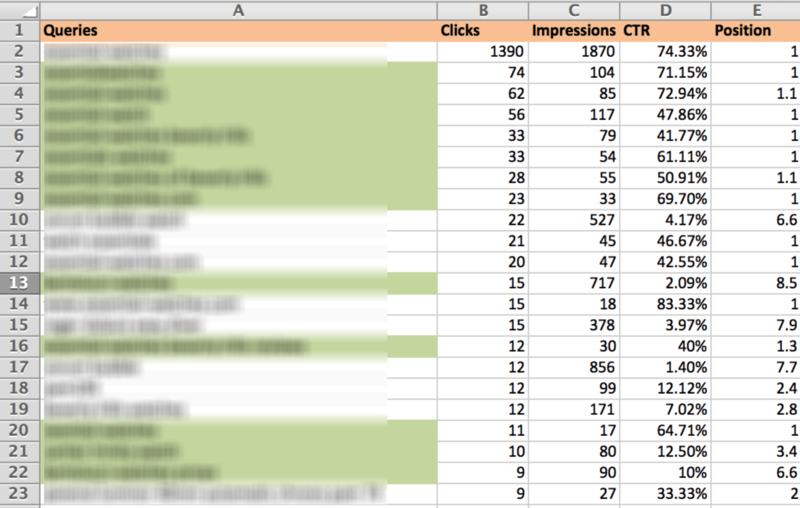 In the example below, the non-brand keywords are highlighted in green, and the brand keywords are highlighted in red. Do I Still Need To Do Keyword Research? Of course you do! Remember in the movie Stargate when the lab guy explains that for space travel you need six points to define the destination and another one to define the point of origin? (By the way, this is Hollywood misinterpretation – you only need three to define the destination and one for the origin…just like GPS). Following this example, the core keywords you come up with after your keyword research are your coordinates to the destination. Your origin is the current status of those keywords – the signals I talked about earlier. Without one or the other, there really can’t prove any progress. Sadly, it is common to only check ranking on core keywords without really knowing the other important metrics needed to start moving the spaceship to its destination. Do I Still Need to Check Ranking? Not really, however, I found it very difficult to let others see it through this perspective, so in some cases, I still provide this data alongside all the goodies above. It simply keeps everybody happy. What About the Success Metric? Success metrics are merely Conversion Goals. This is a whole different topic, but I will still cover some of the essentials. You can bring the horse to the river, but you cannot force it to drink! As an SEO specialist, I feel responsible to bring relevant traffic to my client’s website, as well as conversions, but I cannot force a purchase. I define a user conversion when a subscriber signed up for his 30-day software trial. It is not my responsibility to convert them from free subscribers to paying clients. I define a user conversion on a hotel’s website when someone clicked ‘Book Now’. It is not my responsibility to convert them from prospects to vacationers (maybe the offer is bad…). I define a user conversion when a user fills out a form or calls the company. It is not my responsibility to actually sell their services over the phone. 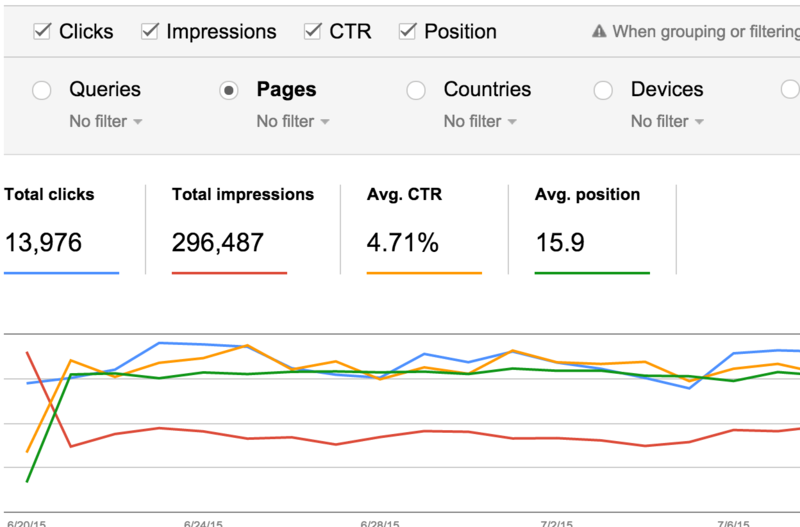 Use Google WMT search metrics data to improve your SEO results. WMT provides 90 days of data. You can align your testing and tweaking strategy, and make adjustments every quarter according to the trends. About the Author: Asher Elran is a practical software engineer and a marketing specialist. He is the CEO at Dynamic Search and founder of Web Ethics.